Vintage Raku metallic glaze ceramic table lamp. This is a very heavy, hand thrown and Raku glazed table lamp from unknown artist. There are no markings to date this lamp. A very beautiful copper,bronze metallic glaze gives this lamp an iridescent sheen. Very beautiful and a great conversation piece once you know the history and steps of making Raku. This would fit into many different living styles with a simple change of lamp shade.The process of Raku is a Japanese method of creating artwork. It has been westernized with the different technologies now available but the process is still labor intensive. Every step to make a Raku piece is timed precisely and accurately. This piece was definitely done well as there are no cracks in the glaze or in the actual structure of the piece. Lamp itself is 1.6″ tall and 9″ at its widest.Shade NOT included. 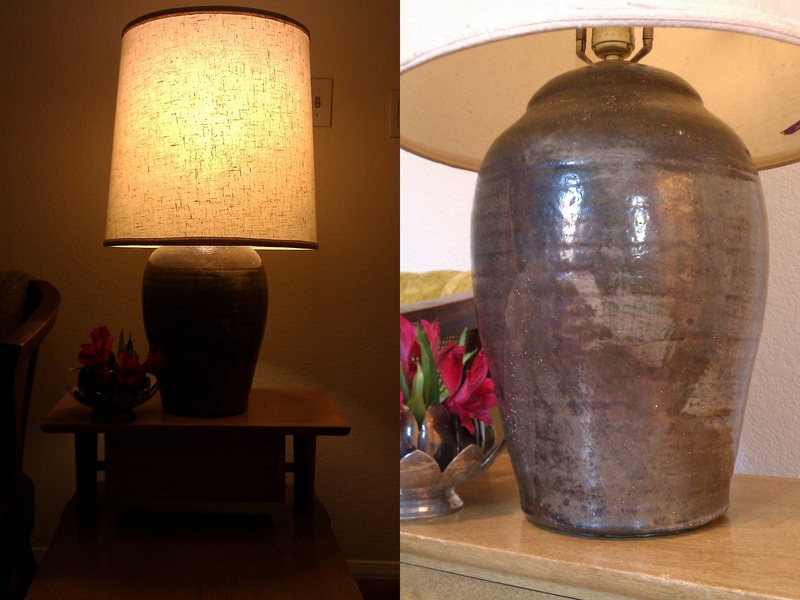 Comments Off on Vintage Raku metallic glaze ceramic table lamp.